There’s been a fair bit of discussion in the past couple of weeks about the topic “Social Media Bubble”. Like most bubbles, it rages as a fad, peaks, then crashes. 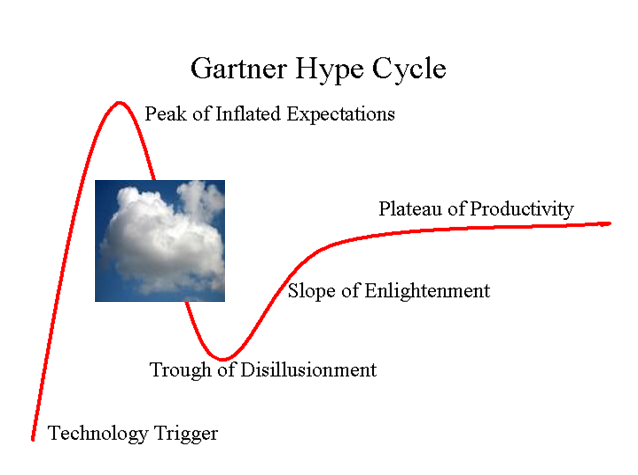 In the Gartner vernacular, social media goes through a hype cycle – early adoption followed by high expectations of value delivery, then a crash into a trough of disillusionment. The idea or technology either dies or survives and moves on to being a real, viable business. Based on recent questioning, social media, as a tool for business, is losing some altitude. Here’s a roundup of some recent opinion from Umair Haque – Harvard Business Review, Rachel Happe – The Community Roundtable, Peter Autidore – The Social Customer and yours truly (previous 2 posts). This dialogue started with Haque’s piece in HBR. His main hypothesis is that social media produces a lot of thin relationships. He draws a metafor to ‘low quality’ as in those in the sub-prime mortgage meltdown. This context implies that bankers didn’t take the time to get to know their borrowers. They relied on short cycle time approvals using only quantitative data. Ironic, given that real relationships are about getting to know people, not just seeing them on a data sheet or as a ‘follower/fan’ on a social media network. Haque goes on to outline the keys to real relationships – mainly trust, disintermediation, community and value. It’s not a beauty contest or about shouting out to be heard about the rest of the crowd. It’s about real relationships that have the equity required to build brands and extend a company’s customer franchise. Rachel Happe offers a perspective that builds on Haque’s by focusing on the value element of relationships. Rachel digs a bit deeper into the weeds by hightlighting the role that online communities play in the formation of relationships – people come together because of a mutual interest and build from there. There is an important point here in that online communities are something much different from Social Networks such as Facebook and Twitter: “Social media is not going to be sufficient to build that kind of relationship.” Face time – that qualitative dimension, it key to building deep relationships, something that technology alone cannot accomplish and at most, falls short. This was a hard-learned lesson in pionner days of CRM of the early 2000’s. Peter Auditore takes an opposing stance. He thinks Haque’s view is “myopic” though we’re not sure why. Auditore is also adamant that the sub prime metaphor is “bizarre”. Seems to me that in the old days, before loan approval processes were automated, your local bank manger got to know you and was an integral member of the lcoal community. People met face-to-face. Familiary and trust were built as a result. In the subprime case, bankers and borrowers alike had very thin relationships indeed that resulted in unbridled risk in the marketplace. Auditor also mixes Word-of-Mouth marketing with social media. To quote Andy Sernovitz, the founder of WOMMA, “WOM marketing is not about social media at all. Social media is just one WOM tool.” Andy goes on to say that WOM only works for good companies that make good products. This last point is core to Haque hypothesis and one that I fully support (see “My New Levis Jeans: Outside the Social Bubble”). Competitive advantage is gained by a specific core competency, not just by the use of social media tools – Kodak and Procter & Gamble had strong franchises pre-Internet. I think there needs to be a better balance overall between leading with technology and considering the importance of the brand’s overall value proposition. Many brands that are market leaders established solid consumer franchises well before the Internet and may or may not benefit to varying degrees from social media. Many enterprises are experimenting with various social media technologies and tools to channel content, engage consumers and build their brands at the tactical level. They also admit that while there’s a lot of beta testing going they’re not ready to declare mainstream adoption of social media tools. One proof point: most adspend goes to television; consumers are watching more TV than ever whether on a TV screen via computer (see Nielsen for the data). Large enterprises especially are approaching social media with a curiosity and critical eye. Let’s remember that Haque makes it clear that his view is a hypothesis and not the final word on social media. There’s plenty of room for constructive dialogue (one way of sharing and buidling mutual trust amongst people). What’s most important is to take a critical eye, be dispassionate about the issues and ask key business questions. Until such time as the business merits of social media are proven, we’re all still somewhere in the cloudy part of the Hype Cycle.